What is a pre-set feed? The purpose of feeds inside Leadfeeder is to segregate the data so you can quickly and easily see the most critical information. More importantly, when reviewing these Basic Feeds daily or weekly, it allows you and your team to efficiently view this critical information and act upon it to connect, qualify and convert interesting prospects visiting your site. All leads: Displays all the leads within a selected time frame. Followed companies: Displays companies that you are following. Leads assigned to me: Display companies that are assigned to you. New leads: Displays companies that have visited the site for the first time during selected timeframe. 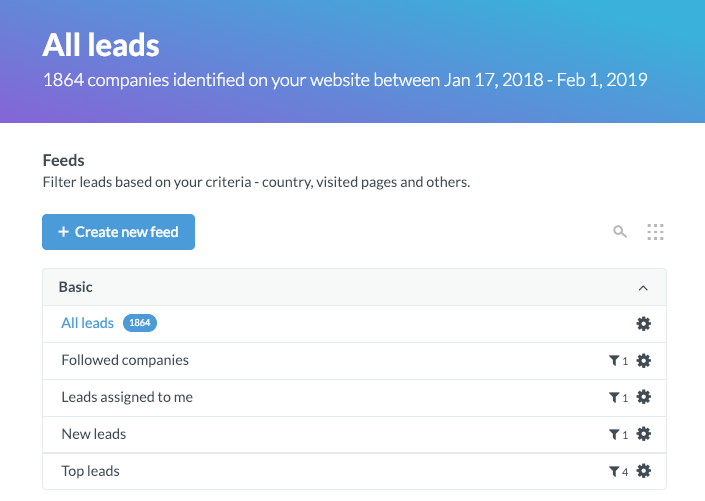 Top leads: Displays companies matching these criteria: more than three page views, from any industry except Telecommunications, not assigned to any user. You can edit or remove basic feeds (but not All leads) in order to modify the feeds according to your own preferences. When you log-in to Leadfeeder you can access all your feeds from the dropdown menu in the top left of the screen. The default feed is All leads. How do I create my own custom feed?